July 4th. Most people attribute the summer holiday with being together with friends and family, firework shows and good food. But for me, July 4th will always remind me of my breakdown. I had been feeling the cracks and splits within myself for a long time. The ‘not good enough’ voices had been there for years, but they had definitely gotten worse. I had become “a puttying master” – fixing the crack that went the deepest in my soul, then moving to the next in order to prevent a complete fall apart. I told everyone in my life that I was fine. I’m. fine. On the morning of July 4th, I broke down crying to my husband, Jeremy, telling him I just couldn’t pretend any more. I was profoundly not ok. I couldn’t live with the voices in my head telling me ‘I’m not enough’ any more. But I had no idea what to do. I had been praying so hard. Reading my Bible so much. Trying to muscle enough “umph” to just believe enough that I could be healed of such tortursome thoughts. But all of my pressing, white-knuckling and pretending was not enough. I was tired and my soul needed resuscitation. Later that afternoon, our family headed to a friend’s 4th of July party. As we walked in, I was put together on the outside, but I knew my insides were still threatening to spill out and ooze all over everybody. It was one of the last places I wanted to be, in the “soul condition” I was in. I was walking into a party with friends we loved, but couple’s who all had strong, confident and beautiful women as the wives and mother’s of each family. I felt like I didn’t belong. Like I was an impostor, sharing company with such women. I ached to feel as confident and brazen inside as my friend’s appeared to be on the outside. My ‘not good enough’ thoughts were deafening as I focused on what each woman brought to their family that I seemingly could not. Kara held a firmly grounded view point on mothering and family values I longed to be clear about myself. Tatum, was wife to a pastor and a woman of deep faith, the kind where she seemed to believe in her core and never waiver. Leeana, was a deep and soulful author and a fashion guru. And Elaine was an incredibly gifted therapist – someone I respected – and the person I had always secretly wanted to be like “when I grow up”. Late in the evening, the adults gathered around the mini bar – each of us holding up a shot of tequila in our hand, cheers’ing to a happy 4th and having sweet friends together. I swayed my body to the music just like I did so often all those years ago at fill-in-the-blank bar. In that split moment I felt a mixture of familiarity and discomfort. Familiarity, because I knew how to be “that girl” who was a little bit of a mess, dancing, with a drink in her hand, pretending everything was fine. Discomfort, because that was a girl I didn’t want to remember from all those years ago. She was someone I had spent an awful lot of time ignoring and burying. Somehow, as we drove home that night, I knew deep in my soul something was awakening and needed discovering. Somehow I knew a truer me needed to emerge from the facade. Somehow I knew it was going to be painful. And I had a feeling it had something to do with the girl back there holding the shot in the air, swaying to the music. Of course your story is uniquely different from mine. But for those of us who suffer from not feeling good enough, you may recognize some common threads. Feel unworthy. For whatever reason, when we make ourselves small or have no soul voice, very often we have believed that we are not deserving or ineligible of love and belonging. We feel unworthy of taking up space, anyone listening to us or (God forbid!) investing in us. Often this can be marked by over-apologizing for ourselves. Hold back our opinion and have difficulty making decisions. It’s difficult to share our opinion when we don’t feel worthy of it being shared. When we hold ourselves back, it can further feelings of being invisible and unknown. Struggling with sharing our opinion can also turn decision making into a torturesome task. A lost sense of identity. 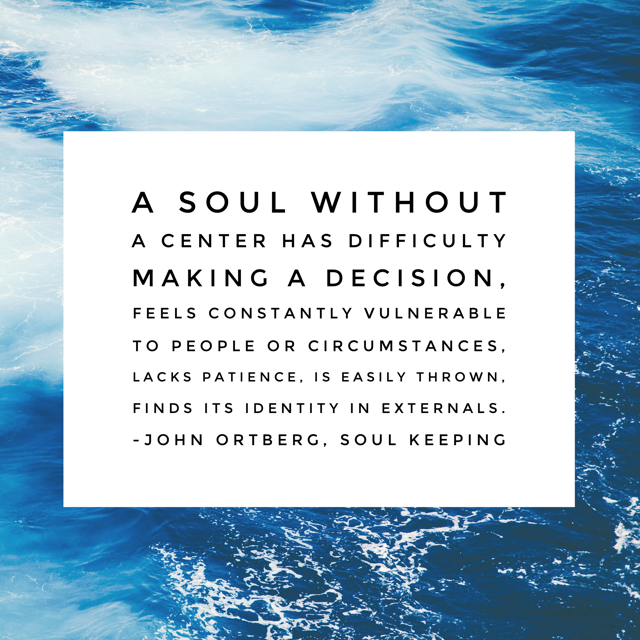 Deep inside each of us is a full, true self that wants to emerge. When we live in smallness and voicelessness, we inherently know part of our story is missing. It’s difficult to attain peace when part of us is buried. Our relationships suffer. Our spouse, friends and family most certainly take a hit when parts of us are hidden away or diminished. Our relationships can not fully bloom or reach their potential when only half of the equation is showing up. Is there a part of your soul that feels voiceless? Are there ways you are making yourself small in your life? Next > How Did We Get So Small? I could have written this myself… I have felt this so deeply before as it tears harshly at my soul. Such a hard battle to walk internally. Thank you for sharing a piece of your story. Thank you for your encouragement Summer! Being vulnerable is never easy, but it is 1,000x worth it when it touches the one… I love what you’re writing about too – intentionally authentic – love it! I’m excited to follow along. (And way to go on joining the challenge this year – it’s my first year too👍🏻). yeah, i can relate to the first one. feeling like i’ll be a burden if i ask other people for help or talk to someone about anything troublesome. i understand that sometimes it’s not true& maybe even most times it’s not true? but the more i struggle, the more i feel like i can’t burden anybody else with it. and become literally “voiceless” as you said. never thought that it may come from lack of worth though. It’s seems pretty universally hard for any of us to ask for help or open up about the real stuff in our lives (you’re not alone). And you’re right, not everyone can handle it… which makes it especially important to find safe people to talk to – people who will be kind to you, see the best in you and believe in you. There is so much power in being able to speak our truth. I don’t know you, but I do know you are worth knowing and worth being heard. Thanks for stopping by here!